Staples' Connor Chamberlin, left, moves with the ball during a game on Tuesday. 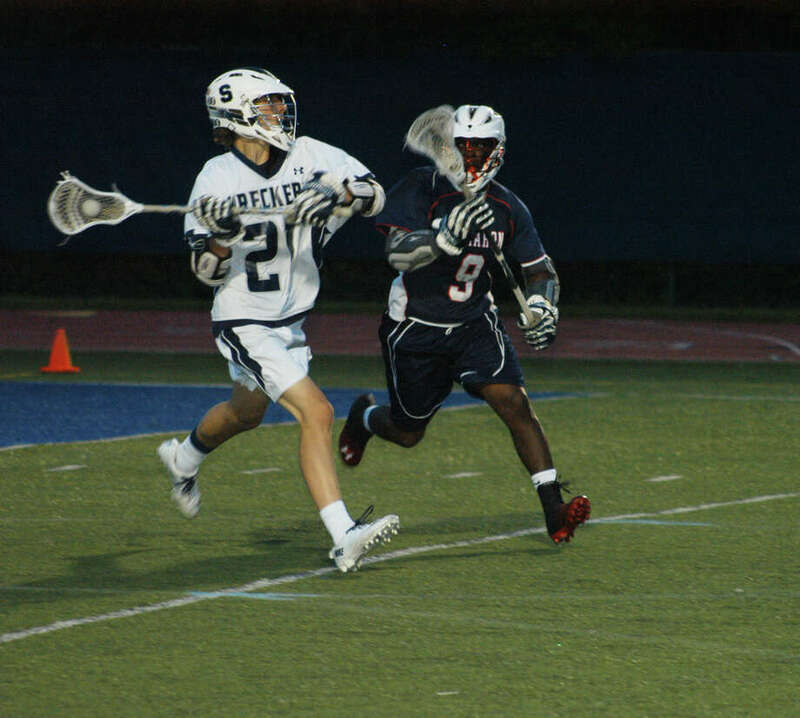 Staples High School's boys lacrosse team dominated the first half and withstood an early third-quarter Brien McMahon barrage to earn a 10-5 victory at home in a key FCIAC battle on Tuesday night. A six-goal performance by Michael Reale led the offensive efforts as the Wreckers finished the season at 12-4 (9-2 FCIAC) and the Senators dropped to 10-5 (7-3) heading into their May 21 season finale against Fairfield Warde. "The win feels great, we really needed it," said Reale, whose squad earned valuable points toward both the FCIAC playoff and Class L state playoff rankings. Staples coach Paul McNulty said he believed the win sealed up the fifth seed in the FCIAC playoff bracket, pending the outcome of other games and tiebreakers. One thing it did for sure was give his team an edge over McMahon in the state tourney bracket placement. The Wreckers built a commanding 6-0 halftime lead on a pair of goals each by Reale, Will Johnson and Patrick Lesch. Reale made it 7-0 only 56 seconds into the third quarter. The Senators then scored the next four goals, including three separated each by seven seconds -- two of those by Terrance Desences. It was 7-4 Wreckers, and it was suddenly a new game with 5:09 left in the third. The Wreckers discussed the need to shut down the Senators on a play in which the McMahon team members came up the middle to cash in on scoring chances. McNulty knew the Senators would give his team some trouble after halftime. "We knew they were going to come out motivated to play well and we had to match them," the coach said. Out of the timeout, the Wreckers stopped the bleeding with Eric Zurmuehle winning the faceoff and getting the ball to Lesch who set up Reale for yet another goal that made it 8-4 with 5:02 left in the quarter. Less than a minute later, Reale circled around from behind the net and whipped home yet another tally, this one from a sharp angle. The teams traded late fourth-quarter goals. Staples goalie Cole Gendels made seven saves. McMahon netminder Josh Miller stopped 14 shots. Staples player Isaac Paparo led the way with seven ground balls. Defensive play by Max Fuld, Lucas Jackson, Josh Willis, Paparo, Jack Greenwald and Teddy Coogan was crucial in the outcome, McNulty said. When the defense wasn't doing its part, the offense was controlling the ball and waiting for good scoring chances. "I think we really possessed the ball for most of the game as a team," said Reale, noting one of the important factors that led to victory. Reale, clearly with his six goals, was a huge reason the Wreckers won as well. "We ask good players to play big in big games and he did," said McNulty, adding that Reale missed three weeks of action due to a third degree laceration of the spleen. He returned to the lineup on May 8, just in time to help the Wreckers beat Wilton 9-8, giving Staples its first ever win over the Warriors. The teams have matched up since 1974, and McNulty previously coached at Wilton, making that win all the more special. Staples, since beating Wilton, has won six straight games as the team heads into the postseason.